Dr. Micheline Sheehy Skeffington, granddaughter of Ireland’s most famous suffragette, Hanna Sheehy Skeffington, took an equality case against her employers, NUI Galway, one hundred years after her grandmother’s successful fight for the vote for women. The University had not promoted Dr. Sheehy Skeffington for twenty-four years from a middle-ranking College Lecturer to Senior Lecturer. In 2009, only one out of 17 successful candidates was a woman. This woman was not in the Science, Medicine and Engineering promotion group (Dr Sheehy Skeffington’s group), but in the Arts, Social Sciences, Commerce and Law group. Dr Sheehy Skeffington has taken the case on behalf of all Irish female academics who are known to be severely discriminated against at the level of Senior Lecturer or above. A European Union report (European Commission 2010) shows that in 2009, Ireland had only 10 % of senior lecturing posts (Grade A) held by women. The only two European Union countries with a lower percentage are Malta and Luxemburg. Ireland has the second highest Glass Ceiling Index after Malta for women in higher education in all of Europe (European Commission 2010). Mary Robinson was being inaugurated as Ireland’s first female president the same day as Dr Sheehy Skeffington was interviewed for her last –and only- successful promotion, from Junior Lecturer to College Lecturer. Since then, despite regularly applying for promotion to Senior Lecturer, Dr Sheehy Skeffington has remained a College Lecturer, watching younger male colleagues being promoted ahead of her. 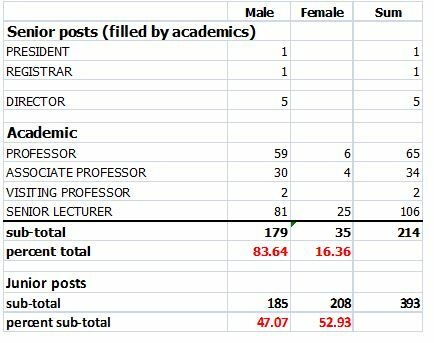 In data available in NUI Galway, it is evident that in 2010 (Figure 1) only 16% of the academics at or above Senior Lecturer level were female, and 53% of those in posts below Senior Lecturer were held by female staff. This glass ceiling occurs in all Irish universities just below Senior Lecturer level (Cooke, 2010) , but NUI Galway, by its own report is the worst in Ireland. This ranking has not changed since 1986 (Anon 1990). 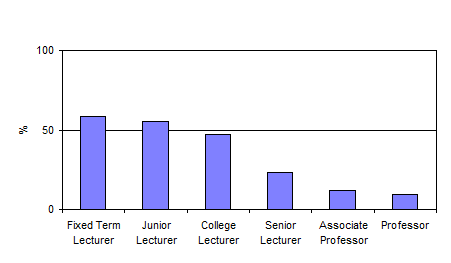 The evidence shows that, whereas women hold roughly 50% of posts in the junior levels, less than a quarter (24%) are Senior Lecturers and less again (12% and 9%) are in the top posts (Fig 1 and Table 1). Thus 10% of women are at professorial level in NUI Galway, compared to 18.7% women as heads of school and professors in Britain (Barrett and Barrett 2011). Focusing on the case of promotion to Senior Lecturer, the rate of promotion of female candidates has varied (with only 6% of female candidates promoted in 2009) and overall it is considerably lower than the rate of promotion of male candidates (Table 2). In other words, the proportion of women candidates promoted, in the last 4 rounds was considerably lower than for men. 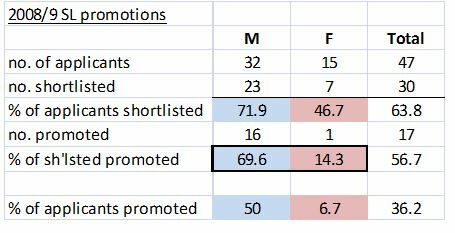 In the 2008/9 round of promotions to SL –the round relevant to this case (Table 3), roughly 70% of male candidates were shortlisted and 70% of these were promoted, but only 47% of female candidates were shortlisted and a mere 14% of those were promoted. Only one out of the 15 female candidates (6.7%) was promoted, but sixteen out of 32 male applicants (50%) were promoted. In her Science, Medicine and Engineering section, none of the eight candidates promoted was a woman. Dr Sheehy Skeffington’s appeals to the University’s own discrimination and procedure committees were dismissed. So she took the case to the Equality Tribunal, although previous such cases have never been successful. This is despite the evidence that discrimination is manifestly endemic in Irish Universities (e.g. http://www.ifut.ie/content/women-excluded-top-academic-positions-our-universities-says-ifut). There is also a UCC document (Ó Gráda et al 2012) addressing the ‘glass ceiling’ within that institution. Of the salaried academic staff, 84% of senior positions are filled by men (Table 4), whereas over 50% of junior posts are occupied by women. Dr Sheehy Skeffington is very keen to strike a blow for all female academics so that Irish Universities will be forced to correct their shocking discrimination against women in the promotion to senior academic posts. She has also taken this case to honour her grandmother and the other Irish suffragettes who did so much for women in the early 1900s. Hanna Sheehy Skeffington twice went to jail fighting for votes for women. She broke windows in Dublin Castle for which she was first imprisoned, and eventually went on hunger strike. She lost her job as a lecturer at Rathmines College on her release. The glass ceiling is not unique to NUI Galway. All of Ireland’s universities strive to maximise income generation through research and to raise their international profile in terms of staff status and high-end publications and thus international rankings related to those performance indices –not the position of female academics! As a result, not just women, but all academics who care more about their contributions to students and society will lose out (see e.g. Doherty and Manfredi 2010; Lynch 2010; Barrett and Barrett 2011). It has also been shown that in gender blind assessments, women fare equally to men: ie assessors, men and women alike, tend to downgrade a candidate’s equally high performance if they know a candidate is a woman (Wennerås and Wold 1997; Barres 2006; Barrett and Barrett 2011). Cooke, A. (2010) The Distribution by Gender and Grade of Academic Staff in the National University of Ireland, Galway. Report to NUI Galway Governing Body Údarás na hOllscoile. Anon (1990) The Position of University College, Galway, regarding the Implementation of the Recommendations of the HEA Report (1987) on Women Academics in Ireland. See biography by Margaret Ward (1997): Hanna Sheehy Skeffington. A Life. Attic Press, Cork. Doherty L., and Manfredi S. (2010) Improving women’s representation in senior positions in universities Employee Relations Vol. 32 No. 2, pp. 138-155. Lynch, K. (2010) Carelessness: A hidden doxa of higher education. Arts and Humanities in Higher Education 9: 54-66. Barrett, L. and Barrett, P. (2011) Women and academic workloads: career slow lane or Cul-deSac? Higher Education 61: 141-155. Barres B. (2006) Does gender matter? Nature 442: pp133-136. Wennerås, C and Wold A (1997) Nepotism and sexism in peer-review. Nature 387: pp 341-3. As a result of Dr Sheehy Skeffington’s case, the university set about addressing the imbalance in promotion of female staff to Senior Lecturer. For the 2013/14 round of promotions to SL, the interview boards were trained in gender issues and comprised more women than previously. There was also a guarantee that were five women not amongst those promoted, the number would be made up to five from those women not promoted. This may have encouraged more women to apply for promotion, as for the first time, there were almost as many women as male candidates. However, whereas the ratio M : F of both applicants and those shortlisted was roughly 50 : 50, nearly 70% of shortlisted males were promoted vs just over 30% females. There is therefore still a huge discrepancy between the rate of promotion of male vs female candidates. Because of the bottleneck of staff at College Lecturer level, men now have only just over a 1 in 3 chance of being promoted. But women now have less than a 1 in 5 chance of being promoted. Plus ça change, plus c’est la même chose. If NUI Galway had truly improved their procedure, then how come not one of the women who were passed over (6) in 2009 was promoted in this recent (2013/2014) round? In contrast, five of the seven men passed over in 2009 re-applied and four of them were promoted. The process needs to be much more transparent and with fully equal promotion opportunities before this case can be seen to have been won.